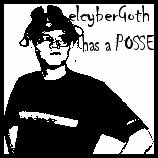 Pictured on the left is something Demp did with MS Paint or whatever and it's sweet because I really do have a posse. January: Play Morrowind. A lot. Thus, it becomes necessary to find alternate sources of income. That's why I've put together a sure fire money making scheme that will have me rolling around naked in piles of cash in no time, no time being whenever they open the bank vaults today. Oddly enough, there was a hyperlink back there, so I think you'll be able to use my scheme too!